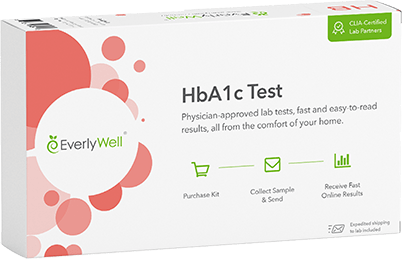 This at-home test is for anyone who is monitoring their cholesterol or who is interested in learning about their current levels. Cholesterol is necessary to make the cells in our body. We get cholesterol from two sources - our liver makes cholesterol and we can also get it from eating foods from animals. We measure cholesterol directly rather than a calculation. 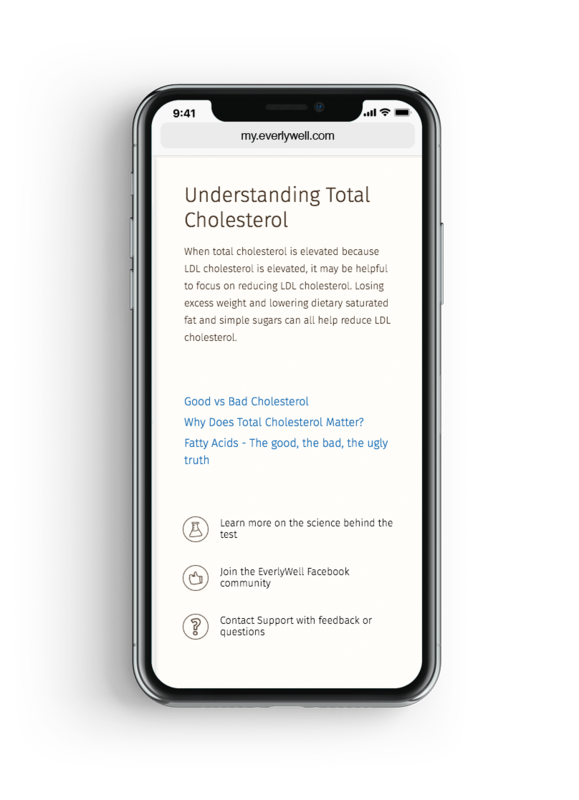 Low-density lipoprotein cholesterol (LDL) is generally considered the "bad cholesterol" as it can deposit in arteries and lead to a condition known as atherosclerosis. LDL can be calculated mathematically using triglycerides and total cholesterol values or measured directly – this test measures LDL directly. HDL, high-density lipoprotein, is considered the "good cholesterol" because it is able to carry cholesterol deposits away from arteries and back to the liver where it can be broken down and cleared from the body. Triglycerides are the primary form of fat in the blood. Fats can deposit in organs like the liver and pancreas and interfere with healthy functioning. Once you order, the test materials are delivered to your doorstep. Enter the barcode included with your kit at EverlyWell.com. Complete a simple finger prick collection and return with prepaid shipping. An independent board-certified physician will review your results. Once verified, you’ll receive your results on our secure platform within days. Your results will contain your levels of each marker tested, providing you insight into how they compare to the appropriate standards. Easily download your results so you can share directly with your physician. EverlyWell provides tailored insight empowering you to take action based on your results. If you're using EverlyWell tests to manage a chronic condition, track your levels over time within your dashboard. Our medical director has hand-picked valuable articles for every one of our tests, providing you with the latest information and resources available on topics surrounding our tests. EverlyWell tests are reviewed and approved by an independent board-certified physician within your state. This ensures that any test ordered is relevant to your health and wellness. Each partner lab we choose to work with is CLIA-certified (Clinical Laboratory Improvement Amendments). This means they have to meet high standards to obtain both state and federal certifications and submit themselves to regular inspections. We use well-established and effective at-home collection methods that are easy-to-do at home. We only offer tests that meet rigorous standards for reliability and validity for at-home collection. Having a combined cholesterol and lipids test is one of the most common ways to assess your overall heart health. 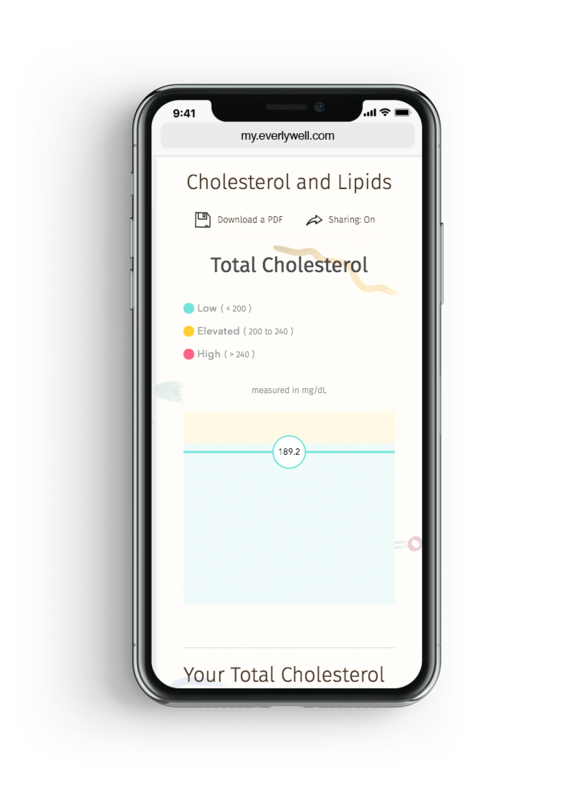 High Direct LDL-cholesterol and triglycerides have been linked to a number of diseases, including heart attack, stroke, peripheral artery disease and atherosclerosis, high blood pressure (hypertension), and type II diabetes. Controlling your blood cholesterol levels can be key to reducing your risk for these disorders. 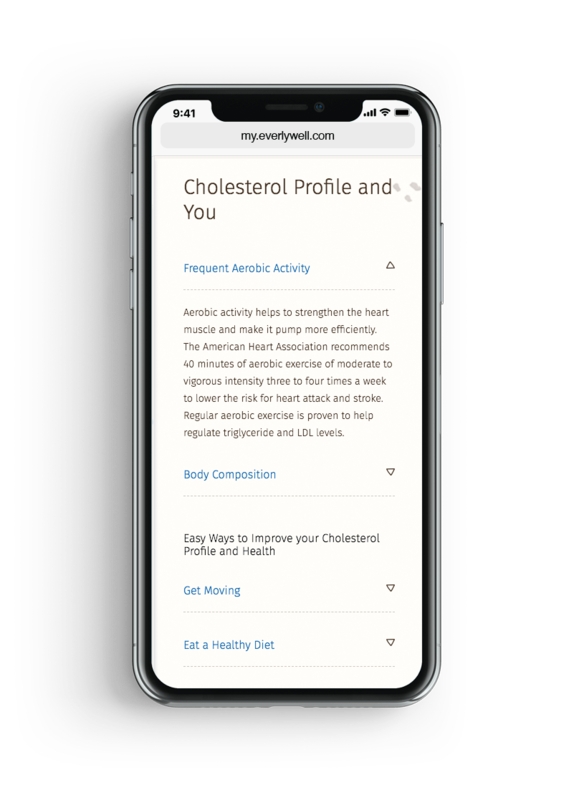 This test evaluates the four key components of a cholesterol test: total cholesterol, high density lipoprotein (HDL), low density lipoprotein (Direct LDL), and triglycerides. 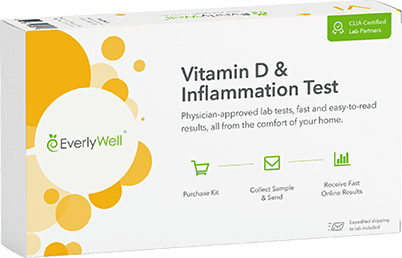 Your results will contain your personal levels of Total Cholesterol, HDL, Direct LDL, and Triglycerides and whether they fall within a low, normal, or high range. It is widely known that variance between labs can occur for any marker. This happens for either dried blood spot or serum samples, and we have ensured that the variation seen is within acceptable ranges according to widely accepted and regulated lab standards. We always encourage sharing the results of your test with your health care provider. 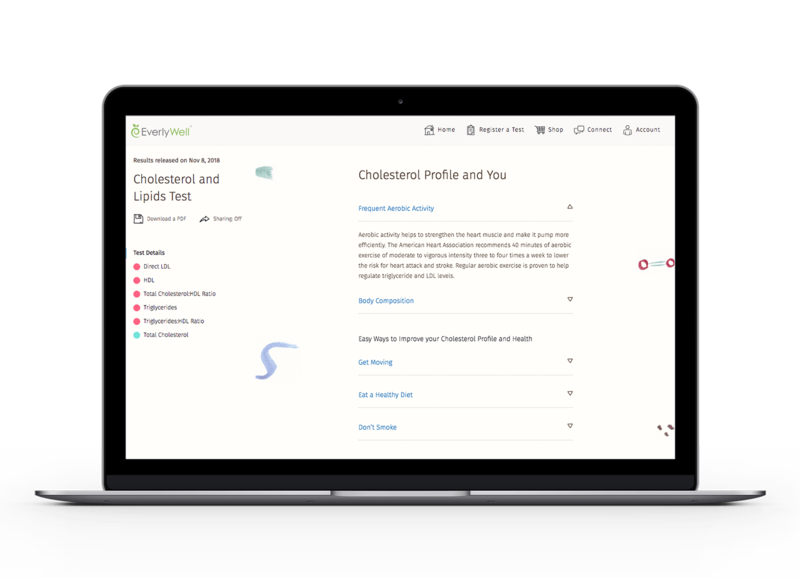 EverlyWell can provide suggestions to jumpstart a healthier lifestyle. As always, we encourage you to share your results with your doctor, who can provide more specific guidance on lifestyle changes. Can I Check My Cholesterol at Home? Is EverlyWell covered by insurance? Test for factors in unexpected weight loss or weight gain. This test measures critical sleep and stress hormones.